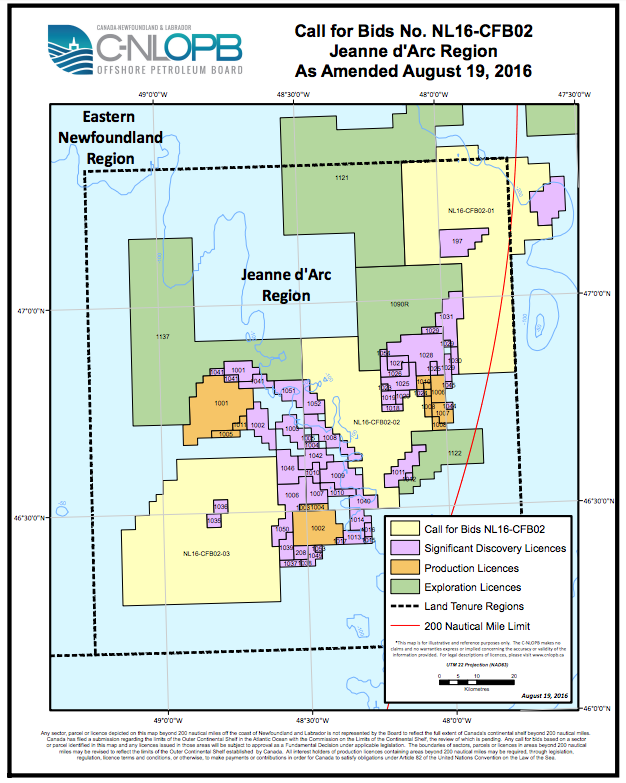 Today, the Honourable Siobhan Coady, Minister of Natural Resources, announced that significant exploration opportunity exists in the province’s offshore as evidenced by the results of Call for Bids in the Eastern Newfoundland Region and in the Jeanne d’Arc Region, both located in the Canada-Newfoundland and Labrador Offshore Area. 8 land parcels were awarded and a total work commitment of $758 million was declared in the call for bids, through the interest of eight successful bidders – three of which are new to the province’s offshore plays. 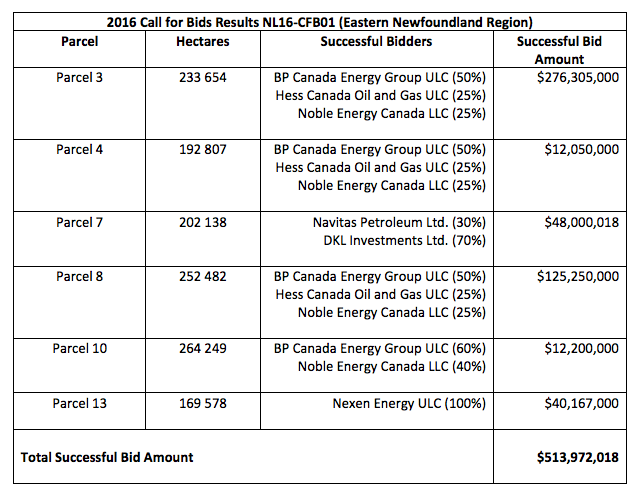 The Calls for Bids by the Canada-Newfoundland and Labrador Offshore Petroleum Board (C-NLOPB) consisted of 16 parcels of land totaling over 3.3 million hectares. 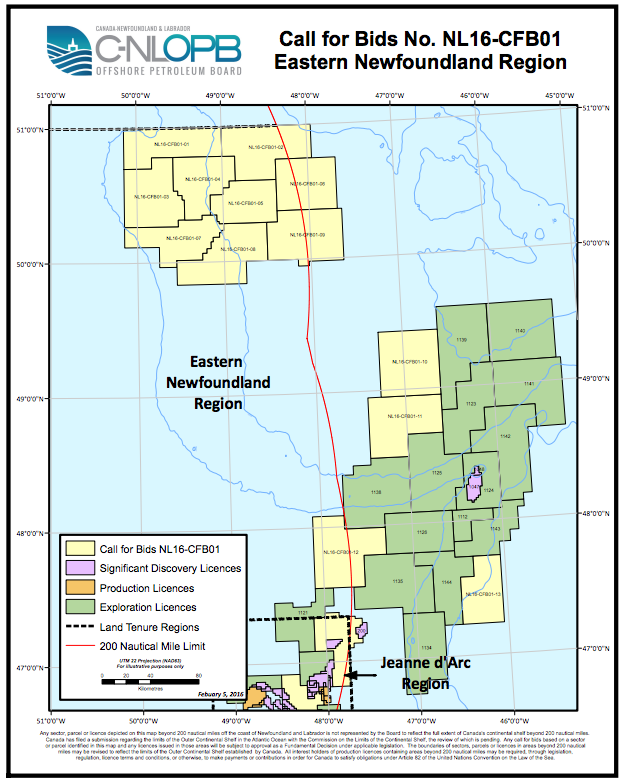 There are 13 parcels located in the Eastern Newfoundland Region and 3 parcels in the Jeanne D’Arc Basin. Additional information on the Calls for Bids is available on the C-NLOPB’s website at www.cnlopb.ca. Offshore Newfoundland and Labrador has been undergoing one of the most comprehensive data acquisition programs in the world today. Through the integration of multiple surveys, a new Lower Tertiary play trend has been identified in the West Orphan Basin. This newly identified prospectivity resulted in Beicip Franlab’s independent resource assessment identifying the in-place resource potential of 25.5 billion barrels of oil and 20.6 trillion cubic feet of gas covering the 2016 License Round area. The play trend contains geology similar to slope and deepwater regions offshore Brazil. One of the key prospects in the area has similar characteristics to Brazil’s Marlim Field. This newly identified prospect has been named “Cape Freels”, which is the closest point of land to the play trend on the island of Newfoundland. The structure of the scheduled license round system allows parcels not taken in previous rounds to be offered in subsequent calls in that region and, as a result of this process parcels in the Flemish Pass Basin were up for bid again this year. Results from last year’s call for bids were also extremely promising, attracting new oil and gas companies to the region. The prospects of development gain momentum and investment as new players and new plays come into being. Much of this success has come from the foundation of work and vision executed by the Nalcor team. Nalcor through its Oil and Gas division holds and manages both onshore and offshore oil and gas interests for the province. 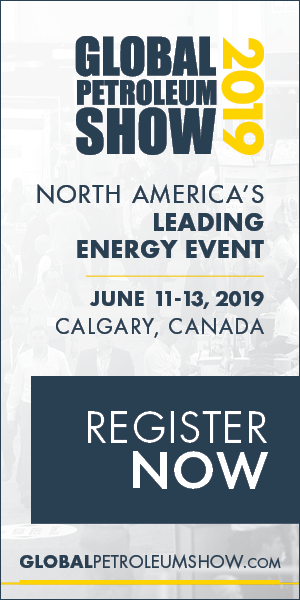 Nalcor Energy Oil and Gas also has an active exploration strategy designed to enhance knowledge and accelerate exploration activity in the province’s numerous onshore and offshore petroleum basins. 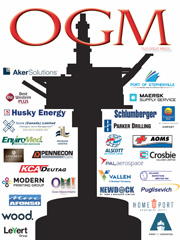 The onshore and offshore basins of Newfoundland and Labrador are vast and largely underexplored, and the modern technologies now available in onshore and offshore research support the development of new oil and gas fields. While the oil and gas industry is in a short-term downturn, clearly, last year’s record breaking land sales coupled with this year’s land sales build an industry with a prosperous future. 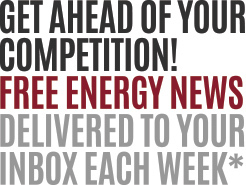 Would you appreciate knowing more about Bids Offshore ?